When you’re dating someone, eventually you’ll have to ask: is this relationship just for now, or is it forever? Marriage is a big deal, it is the ultimate commitment, and not everyone wants to get married. If you want to get married, it can be devastating to learn that the man you love doesn’t want the same thing. Maybe he never wants to get married period, or maybe he just doesn’t want to marry you. No one wants to waste their time on a dead end. No one wants to spend years upon years with someone who just isn’t–and maybe was never– on the same page. There are certain things you can look for, certain signs that will tell you whether the outcome you want is in the cards, but you have to actually look…and a lot of people don’t. Sometimes it’s easier to just turn a blind eye to avoid having to face a truth that you really don’t want to accept…that maybe the man you love doesn’t want to marry you. 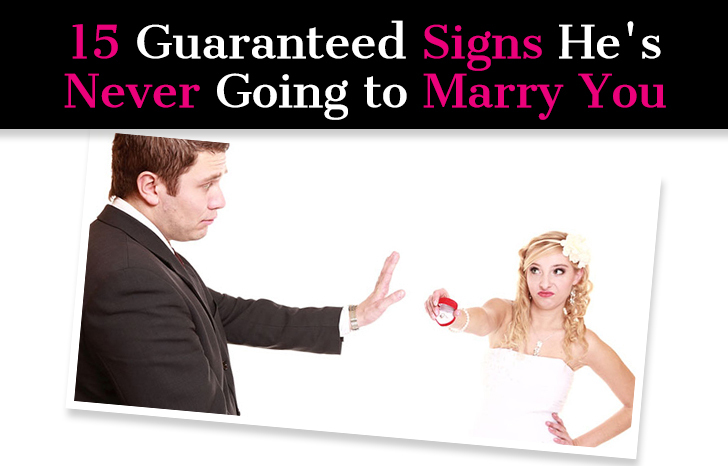 To help you gain perspective and see more clearly, here are 15 definitive signs that he is never going to marry you.